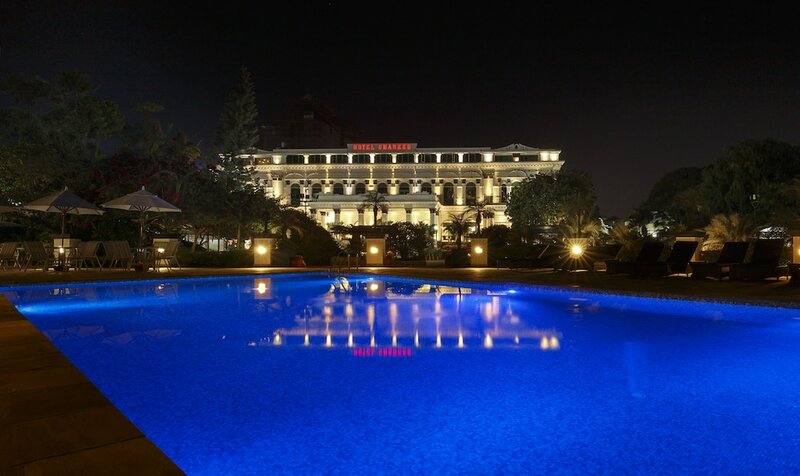 This family-friendly Kathmandu hotel is located near the airport, within 1 mi (2 km) of Narayanhity Palace Museum and Garden of Dreams. Pashupatinath Temple and Kathmandu Durbar Square are also within 3 mi (5 km). 2 restaurants, a full-service spa, and an outdoor pool are available at this hotel. Free WiFi in public areas and free self parking are also provided. Additionally, 2 bars/lounges, a poolside bar, and a coffee shop/café are onsite. All 94 individually decorated rooms feature free WiFi and 24-hour room service. For a bit of entertainment, LCD TVs come with cable channels, and guests can also appreciate conveniences like refrigerators and coffee makers. In addition to a full-service spa, Hotel Shanker features an outdoor pool and a children's pool. Dining is available at one of the hotel's 2 restaurants and guests can grab coffee at the coffee shop/café. The property also has a snack bar/deli. Guests can unwind with a drink at one of the hotel's bars, which include 2 bars/lounges and a poolside bar. A computer station is located on site and wireless Internet access is complimentary. This 4-star property offers access to a 24-hour business center and limo/town car service. Event facilities measuring 4558 square feet (423 square meters) include a conference center. This Victorian hotel also offers a terrace, tour/ticket assistance, and gift shops/newsstands. For a surcharge, a shuttle from the airport to the hotel (available 24 hours) is offered to guests. Complimentary self parking is available on site. Hotel Shanker has designated areas for smoking. Kailash Restaurant - Onsite restaurant. Guests can enjoy drinks at the bar. Cozy Kailash - Onsite restaurant. Kunti Bar - Onsite bar. The onsite spa has massage/treatment rooms. Services include facials and manicures and pedicures. A variety of treatment therapies are provided, including aromatherapy and Ayurvedic. Rollaway/extra beds are available for NPR 40.0 per day.